This stand-alone, ADA compliant, Auto Attendant® receptacle encourages proper litter disposal beyond the gas station pump island. 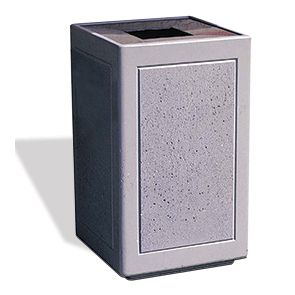 These 24 gallon square concrete trash receptacles accent convenient store and gas station entrances, while perfectly complementing the island units. The aluminum top has a generous 8" opening for easy disposal and shields the exposure of waste contents. A security cable connects the lid to the base so nothing is misplaced while accessing and servicing the polyethylene liner. The solid concrete construction with steel rebar reinforcement ensures unfaltering structural strength and ready to stand up to the harshest of weather conditions. Complementing single and double side Auto Attendant® island service stations are available.